Happy June, ya'll! Welcome to the second iteration of the Social Justice Book Club, a bi-monthly, laid-back online reading club focused on social justice books and readings. 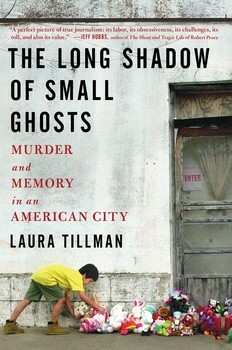 For the month of June, we'll be group reading The Long Shadow of Small Ghosts: Murder and Memory in an American City, by Laura Tillman. In Cold Blood meets Adrian Nicole LeBlanc’s Random Family: A harrowing, profoundly personal investigation of the causes, effects, and communal toll of a deeply troubling crime—the brutal murder of three young children by their parents in the border city of Brownsville, Texas. With meticulous attention and stunning compassion, Tillman surveyed those surrounding the crimes, speaking with the lawyers who tried the case, the family’s neighbors and relatives and teachers, even one of the murderers: John Allen Rubio himself, whom she corresponded with for years and ultimately met in person. The result is a brilliant exploration of some of our age’s most important social issues, from poverty to mental illness to the death penalty, and a beautiful, profound meditation on the truly human forces that drive them. It is disturbing, insightful, and mesmerizing in equal measure. Kirkus called the book "A Helter Skelter for our time, though without a hint of sensationalism—unsettling in the extreme but written with confidence and deep empathy." Publishers Weekly hailed it in a starred review as "provocative long-form journalism that does not settle for easy answers." Let's see what we think, shall we? It's not too late to sign up (even if you're reading this weeks into the month of June!). Feel free to hop in or out as fits your schedule; I just ask that you link up in the sign-up post so I have a sense of who's participating this time around. Because of some crowding on the #SJBC hashtag across various platforms, I'm going to switch us from #SJBC to #SJBookClub; it's a bit longer but hopefully its uniqueness makes the conversation a bit easier to follow. Author Laura Tillman has graciously offered to participate in a Q&A with us as part of this month's club; please comment below no later than June 14th with a question you'd like her to answer, and I'll pick the best questions to share. (If you'd rather, you can send questions on Twitter or via email: ofabookworm AT gmail.) Laura is also on Twitter at @latillman if you'd like to connect there directly!